During the NASCAR Playoffs, tune in to get the code and visit chevyplayoffspromo.nascar.com to enter the Monster Energy NASCAR Cup Series Playoffs Sweepstakes Presented by Chevrolet for a chance to win a fan-built Chevrolet Silverado every race day. The Monster Energy NASCAR Cup Series Playoffs Sweepstakes Presented by Chevrolet is open to individual permanent legal residents of the 50 United States and District of Columbia, who are 18 years of age or older, and have reached the age of majority under the laws of the jurisdiction in which they reside, as of 9/10/18. The Sweepstakes begins on 9/10/18 at 12:00:00 PM ET and ends on 11/18/18 at 11:59:59 PM ET. Limit one Entry Period Prize entry per person or email address for each Entry Period of the Promotion Period. 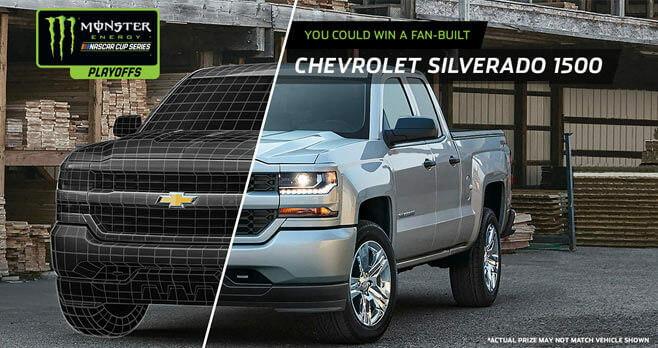 The grand prize consists of a 2018 Chevrolet Silverado 1500 2WD Double Cab, Standard Box Custom customized by fan vote.